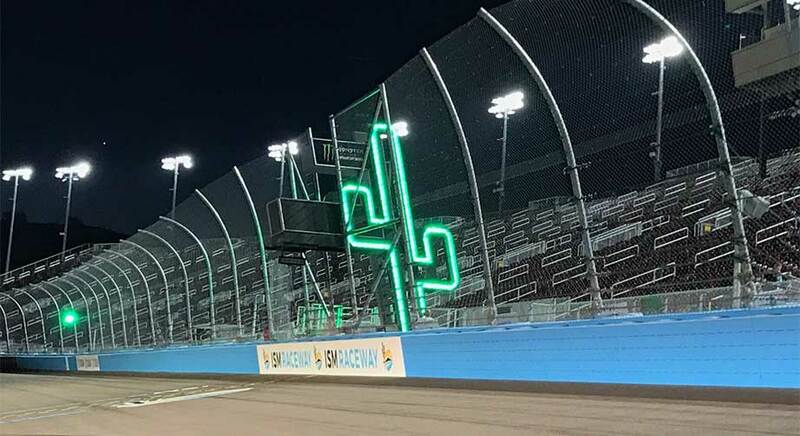 All eight drivers still in contention for the Monster Energy NASCAR Cup Series championship rank among the nine fastest on the 1-mile track type into which ISM Raceway falls. Furthermore, six of that track type’s eight most-efficient passers are Round of 8 drivers. This Sunday’s race has the potential to be an all-timer, with nary an underdog among its most intriguing participants. The track itself has thrown a wild card into the proceedings. The start/finish line is now placed in the dogleg, what was formerly the track’s second turn, where the surface bulges and the inside apron expands. This allows for radical, adventurous lines for the willing and able and could turn the quirky track into a restarter’s paradise. The racing action shouldn’t fundamentally change — anticipate drivers such as Kevin Harvick and Kyle Busch among those most likely to contend for the race victory — but the eventfulness of double-file restarts is likely to improve, allowing for creativity from the restarting elite who were previously stymied by an impenetrable outside line. That outside line served as ISM’s preferred groove, allowing its occupants position retention rates of 94, 87 and 89 percent in each of the last three races at the facility. Cars in the inside groove retained position at clips of 32, 40 and 41 percent, respectively, providing those lucky enough to be assigned an even-numbered restarting position with a massive advantage. It’s not clear whether the inside line will become the choice groove, but those beginning their short runs from the inside now have options not previously offered. Top non-preferred groove restarters like Kurt Busch (a 60.2 percent position rate), Martin Truex, Jr. (59.2 percent) and Harvick (57.3 percent), all three playoff participants seeking an invitation to the championship race, won’t be pigeonholed when beginning their short runs from the inside line. Truex felt every effect of the old restart dynamic in the spring — he scored four positions on four restart attempts from the preferred outside line, but lost three spots on three restarts emanating from the inside. That dynamic won’t be the same, and hopefully won’t saddle a quality restarter like him with pedestrian numbers. Hovering above the cutoff line by 28 points, Busch returns to a track on which he had the fastest car in the spring. Anticipate he’ll be fast, and do so knowing that late-race restarts, which have plagued his average finish splits this season, should now provide him a puncher’s chance. In races with no late-race restarts, his average finish is 4.7, nearly seven positions better than his average in races with at least one (11.5). His legion of fans will point to his near win at ISM Raceway in the fall of 2017 as a reason why he should be considered a favorite this weekend. However, a track favoring good restarters could doom his chances at playoff advancement. Elliott averages a finish nine positions worse in races with an excessive number of restarts (17.4) than in races light on cautions (8.4). His 35.1 percent position retention rate on non-preferred groove restarts ranks last among remaining playoff drivers. The long shot to advance from the Round of 8 is Bowyer, who — despite ranking as a top-10 restarter in each groove — struggles with late-race restarts. In fact, his preferred groove retention rate in the final one-tenth of races drops by 26 percent, yielding an eight-position net loss and a 4.3-position difference in average finish between races without late-race restarts (10.8) and events with at least one (15.1). The more the preferred groove’s impact is diminished, the less Bowyer would welcome a late caution flag. It’s almost unfathomable how good a restarter Allgaier has been in 2018. His 48 positions gained this year on non-preferred groove restarts is by far the most among NASCAR Xfinity Series drivers, with Ryan Preece’s plus-12 the nearest. He’s finished worse than fourth just once in his last seven starts at ISM Raceway, which includes a 2017 victory. Now, his must-see restarting ability is unfettered on a track that already, clearly, suited his driving style. David Smith is the Founder of MotorsportsAnalytics.com. Follow him on Twitter at @DavidSmithMA.